Metsikhovne - translated verbatim as "the guard of the fortress" - were used in Georgia for strengthening cities and castles seized by the Georgian king. These archers were equipped on behalf of the state, most given quality maille armor and a powerful bow. 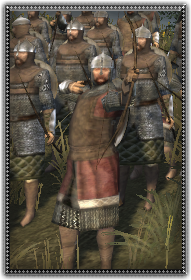 These Metsikhovne can be relied upon as able archers. Metsikhovne are spearmen equipped on behalf of the state in maille armor and managed the chaos of battle with bow, small shield, and dagger.